BLAINE — Receptivity is 98 percent of the spiritual life. 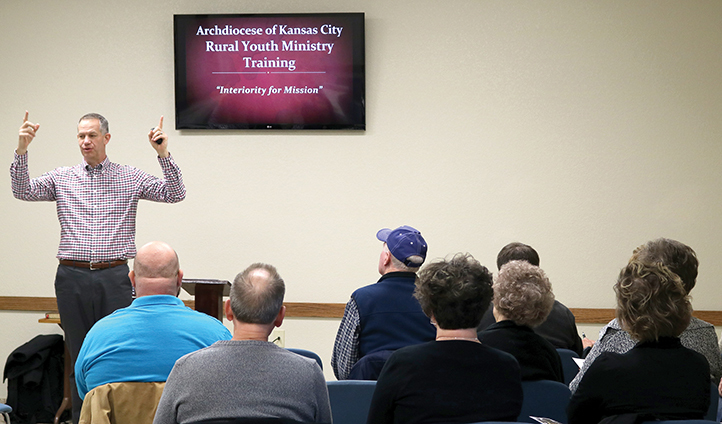 Or so said Jim Beckman, who spoke at three rural youth outreach spring training sessions held Feb. 4-5 at St. Dominic Church in Holton, St. Columbkille Church in Blaine and Sacred Heart Church in Ottawa. The sessions also included an appreciation meal for all those involved in rural outreach ministry, as well as the opportunity for participants to earn funds for their parish youth programs. Approximately 125 participated in the sessions. Beckman, a lecturer in leadership and catechetics at the Augustine Institute in Denver, is the author of “God, Help Me: How to Grow in Prayer” and has been involved in ministry since 1987. Spiritual growth, said Beckman, takes place when you are prepared to listen — or “receive” — what God is trying to tell you. Often, that can only take place after you have worked on developing your interior life. The good news, Beckman said, is: If a person works consistently and honestly on his or her interior life, the results can be amazing. “Imagine what it would look like if it was the other way around,” he said. A person dedicated to his or her interior life can produce gifts of the Holy Spirit such as charity, joy, patience and generosity. There are three components, he explained, in every person’s life — ministry, vocation and a spiritual core. He said a majority of people spend most of their time doing all kinds of activities. For married couples, too often activities take up so much time that the marriage gets what’s left over. The prayer life gets even less, if any. If the spiritual core is not properly attended to, said Beckman, people attempt to satisfy their spiritual longings with things that will not bring lasting happiness. Our core identity, he said, is not our activities or what we do. Every morning, Beckman says he spends about 30 to 45 minutes in prayer, sometimes reading a Scripture passage, other times speaking with God in quiet contemplation. At the end of his prayer time, he picks up his Bible and places it in his backpack. He takes the backpack wherever he goes. When he finds he has allowed his peace to be disturbed, his backpack reminds him of his prayer time. When people spend time in prayer consistently and honestly with God, they know their identity as Christians. Knowing one’s identity is important, Beckman said, because when people understand their identity, they are more predisposed to their unique mission. A person in tune with his or her spiritual life, he explained, will turn to Jesus when experiencing opposition and, in turn, strengthen their spiritual core instead of turning to other forms of consolation. Beckman discussed prayer as a relationship, likening it to any human relationship that involves “essential dynamics.” He summarized it in one word: ARRR! “Think like a pirate,” Beckman joked. People have to Acknowledge something, Relate it to someone, Receive what the other person is saying and then Respond. In closing, he shared the account in the Gospel of Luke of the two disciples walking to Emmaus with Jesus (24:13-35). He used it to illustrate how a relationship with God can be formed. The disciples were walking on the road when Jesus appeared alongside them. The disciples did not recognize Jesus at first, and Jesus asked about their sadness. Jesus did not need to ask the question, says Beckman. He knew the answer already. When the disciples finally recognized Jesus in “the breaking of the bread,” Beckman continued, they were ready to receive his teaching. Two thousand years later, receptivity is something everyone still needs to practice, said Beckman. And for a simple reason. “Receptivity is 98 percent of the spiritual life,” he concluded.